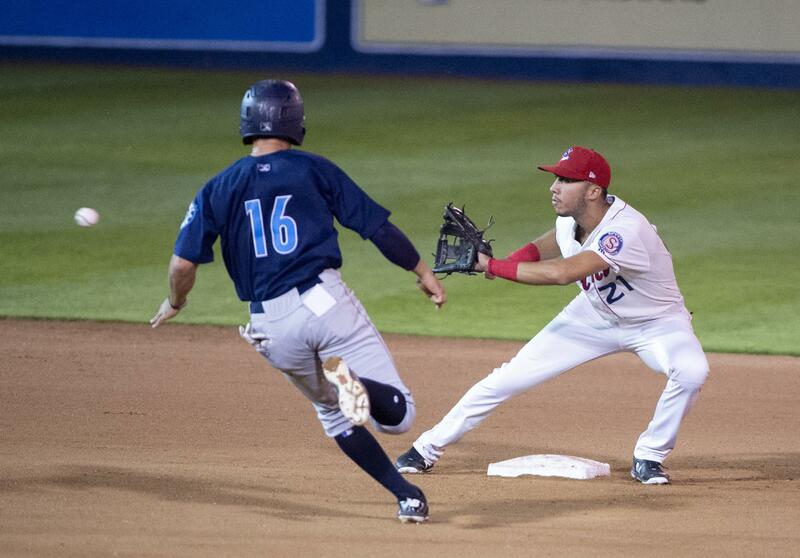 The Spokane Indians are trying to reach the Northwest League championship series for the first time since 2010. On Friday, it’s winner take all. Everett rallied for six runs in the fourth inning off starter Jake Latz and the AquaSox held off the Indians 8-3 in Game 2 of the division series on Thursday at Avista Stadium. “That’s a good team,” manager Kenny Holmberg said. “We’re a good team. That’s why it’s a series. It shouldn’t be a sweep. Last time out, Latz tossed a gem – 5 2/3 one-hit shutout innings with 11 strikeouts against Vancouver when the team needed a series victory to reach the playoffs. The 22-year-old lefty picked up where he left off and cruised through the first three innings without allowing a base runner, but the wheels fell off in the fourth. All seven batters Latz faced in the frame reached – including two doubles, two walks and a hit batter – and six scored to put the Indians in a hole. “Give a little credit to (Everett),” Holmberg said. “They had some good at-bats against a really good pitcher. Latz turned in a quick first inning, retiring the side in order on six pitches. Jax Biggers led the bottom half off with a single through the middle and went to second on a sacrifice by J.P. Martinez. Curtis Terry and Diosbel Arias both bounced out to short to strand Biggers. Latz generated three straight ground-ball outs in the second and picked up a pair of strikeouts in the third as he retired the first nine straight. Starling Joseph led of the third with a walk. Biggers put a charge into one to straight center, but Josh Stowers made a nice sliding catch going away from home that might have saved a run. Martinez lined a single to right and Joseph went to third, but Martinez was called out trying to take second on the play. Terry walked to put runners on the corners, but Arias lined to right to end the inning. Charlie McConnell picked up Everett’s first hit of the game with a single to lead off the fourth. Matt Sanders sent one to the track in right for a double and Latz hit Jake Stowers on the foot to load the bases. Latz went to full count on Cal Raleigh and his fastball on the payoff was just inside to force in the game’s first run. Bobby Honeyman ripped the next pitch into right for a two-run single and 3-0 lead. Ryne Ogren followed with a routine fly to center, but Martinez lost it in the lights. It went over his head and landed safely in medium center for a run-scoring double. Latz walked Connor Kopach to load the bases again and his night was over as Holmberg called on Tai Tiedemann. Nick Rodriguez greeted the reliever with a soft liner to right that Joseph was late to pick up. It fell for an RBI single, but the Indians got a force at second for the first out. Jansiel Rivera followed with single to left to make it 6-0. The Indians came charging back in the bottom half. With one down, Francisco Ventura and Tanner Garnder hit back-to-back singles, then Isaias Quiroz lined one over the wall in left for a three-run homer to half the deficit. Everett had back-to-back hits to start the sixth, but the lead runner was called out on appeal as he missed second base. Meanwhile, the Indians put up little resistance down the stretch. Terry’s single in the fifth and Martinez’s walk in the seventh were the only base runners Spokane could muster in the middle innings. Everett tacked on two runs in the ninth on a couple of hits and a couple of fielding errors. Published: Sept. 6, 2018, 9:52 p.m. Updated: Sept. 6, 2018, 10:07 p.m.